We’re back to zero between San Antonio and Oklahoma City in the final series of the Western Conference. After the revengeful return of Serge Ibaka to find his form in Game 3, OKC sat on its All Star duo Kevin Durant- Russell Westbrook (71 points combined) to catch up with Spurs (2 wins everywhere). One more time limited to less than 40 % in shots ( 39.8%), San Antonio bowed 102-95. Yet impulsed by Kawhi Leonard (10 points) and Tony Parker (14 points, 4 assists), the Texans take the best start with a 0-8. Ibaka (9 pts, 8 rebounds, 3 blocks and 1 steal) scored the first points of the Thunder that glue together a unit after a 7-0, 11-12. 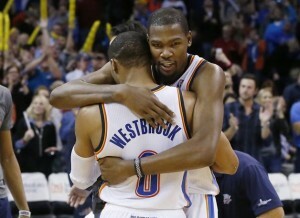 Westbrook and Durant then take control of operations, OKC finishes the quarter time on top, 26-20. Just like Tim Duncan (9 pts, 6 rebounds, 4 wt) San Antonio is suffering facing the Oklahoma interiors. To make matters worse, the men of Gregg Popovich immediately sanctioned the lost balls (13 balls lost with a 21-0 counter-attack). The MVP of the regular season is untenable in the second quarter, 14 point 6/6 with two long distance missiles. Spurs are in the hard, 32-23 Q2, 58-43 at the break. In the second half, the Thunder continue blasting their opponent. Men of Scotts Brook widened the gap to 27, 76-49 in the third quarter with a Westbrook of great nights. Boris Diaw (14 points, 10 rebounds, 3 assists), Cory Joseph (11 points) leave the bench to stop the bleeding, 83-67 at the start of the last twelve minutes. The gap is reduced to 12 points in the final act, but the duo of Thunder meets to give a second win in their franchise in this series completely restarted. RussWest finished his show with a line in the playoffs ever seen since Michael Jordan: 40 points (12/24 shooting), 10 passes , 5 rebounds, 5 steals and 1 block). 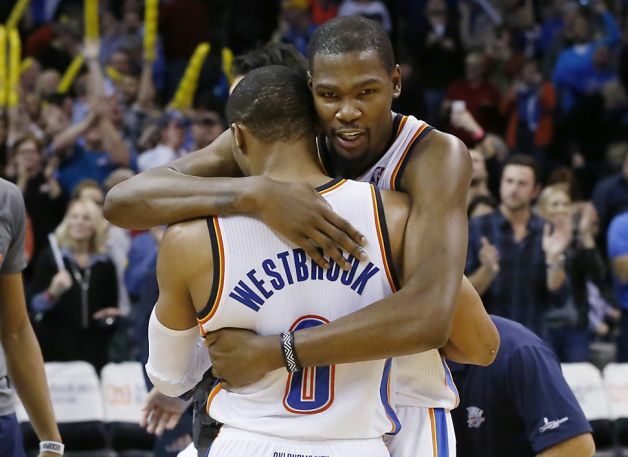 Kevin Durant cracked 31 points (11 /21), 5 rebounds, 5 assists, 3 steals and 1 block. The next match of the series will take place at the AT & T Center.